Whether it's a discounted, a fixed rate, or tracker mortgage, they are all split into 2 distinct groups. Some people who take out an interest only mortgage also set up a separate savings/investment account which they contribute to every month and then use the balance to repay the loan. And most lenders will encourage this, but won't insist on it. However, in reality most won't be able to do this as the reason they took out an interest only mortgage, rather than a repayment style, is that their budget won't stretch to the higher monthly payments that a repayment mortgage requires. The table below shows the difference in the monthly payments of a repayment style mortgage versus an interest only one. For example, if you take out a £100k loan and the interest rate is 5% the monthly payment will be £591 (repayment mortgage) and £417 (interest only mortgage). And that is a significant saving. What's interesting to note is that when interest rates are low (under 4%) the difference between the 2 mortgage styles is significant. But with rates at 7%+ it starts to shrink dramatically. So it's no surprise as UK interest rates have averaged under 5% for the last 10 years that interest only mortgages have been so popular. Also, high property prices, even though they're down from their 2006/07 peak, have forced many homeowners to take out interest only mortgages because the size of the home loan needs to be so large. Most people think that an interest only mortgage is far cheaper than repayment style. And that's true if you look at the lower monthly payments needed to service the loan. This is an important point to consider. Yes, if you take out an interest only mortgage over 25 years the original loan has to be repaid. But the price of the property (in 25 years) should also be taken into account. Theoretically it would be possible to buy a property today for £100k using an interest only mortgage and in 25 years value of the property would be £400,000. If so, even though the mortgage will have cost far more in monthly interest repayments (than repayment style) there would still be £300k of equity in the house and repaying or remortgaging the original loan wouldn't be that hard. Points like these are worth thinking about, but it's also important not to assume that property values will rise significantly. Yes, property seems like a great investment, and it is if bought at the right price, but still it's no one-way street and many people have lost fortunes over the years, usually buying property when prices are high by historical standards, ie they bought towards the top of booms. My point is that interest only mortgages are inferior products to repayment style. But if you take natural house price inflation into account (say +3% a year) these mortgages don't look as bad as some would have you believe. One group of people who tent to like interest only mortgages are those who work in a profession (doctors, lawyers, dentists, accountants etc) with an almost guaranteed chance of promotion in the future. And promotion normally leads to large salary increases. So a junior accountant might be paid 25% of what he can hope to earn in 5-10 years. She might therefore take out an interest only mortgage with a plan to refinance it to a repayment style when her salary can afford the higher payments. A half-half deal (or could be 75/25 etc) is where half the mortgage is interest only and half repayment style. For example, total loan of £100k, £50k interest only and £50k repayment. 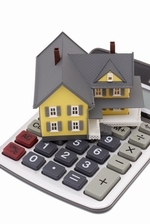 The advantage to this strategy is that a good proportion of the loan is being repaid. Interest only mortgages are not bad financial products if you've done your research and understand the concerns discussed above, ie the original loan has to repaid at the end of the mortgage term. Also remember that they are more expensive than repayment style mortgages. However, because of high property prices (even after the recent slump) some people are forced to use interest only deals because they can't afford repayment style. I can fully understand this strategy but if possible try to remortgage into a repayment style deal in the future.